The start of a sprint race is that part of the race from the firing of the gun to the departure from the starting blocks and the term usually includes the first strides out of the blocks. The above describes the motion of the athlete from the time he prepares for the start until he leaves the blocks in the first phase of the race.In preparing for the start the athlete must consider a range of variables from where to position his blocks in relation to the starting line and each other, what angles he should have his blocks set, the position he assumes before and after the gun is fired, and the force he applies as he leaves the blocks. In this paper I would like to consider some of these variables and their effect in improving the start, with reference to some of the literature written on the subject. The principal purpose of the sprint start is to facilitate rapid clearance from the blocks and acceleration to maximum speed. There are a number of broad objectives of the sprint start. him to come out of the blocks well balanced and with the greatest possible velocity, as he moves into full sprinting position. Finally the athlete must attempt to clear the starting blocks in the shortest possible time after the firing of the starters gun. There are three main types of starting positions for the sprint start. The principle difference between these starts is basically the horizontal distance between the front and back feet of the athlete. 1. The Bunch Start : (Sometimes referred to as the Bullet start) This is where the feet are close together with the toes of the back foot opposite the heel of the front foot. Sometimes the feet are even closer together. This would usually involve a block spacing of less than 30cm. less than shin length apart, but not so close as to call a Bunch or Bullet start. This position could be referred to as a ‘Short Medium Position’. An inter-block distance of somewhere between 30 to 50cm could be described as a medium start. 3. Elongated Start : the knee of the back leg is placed level or slightly behind the heel of the front foot. It has been described as a position where the inter-block distance is well in excess of shin length. An inter-block distance in excess of 50cm could be described as an elongated start. The most common factor studied has been the effect of block spacing on the start. The major research studies support the use of a medium anteroposteior spacing between the feet. ( Henry 1952, Menely & Rosemier 1968, Sigerseth & Grinaker 1962 ). the influence of the start on the complete race. Henry (1952) presented evidence that the use of the 11 inch bunch start resulted in the faster block clearance, but with less velocity than those achieved from the medium position, resulting in significantly slower times for the 10 and 50 yards. The highest proportion of best runs were from the 16 inch block spacing, which would be classified as a medium start. Sigerseth & Grinaker (1962) findings after studying times for 10, 20, 30, 40 and 50 yards supports those reported by Henry. The medium start offers the greatest advantage to the sprinter. Much has been written and discussed about distance between front and back blocks, but ignores the effect of differing block angles. A recent study by Guissard, Duchateau & Hainaut 1992 has shown that variation in block angles can have a profound effect on starting velocities. In the study 17 athletes used their own preferred distance between blocks and starting line. They all used a rear block angle of 70 degrees, but tested three angles with the front block : 30, 50 & 70 degrees. velocity when block angles are decreased. The explanation for this improvement is that the ankle joint is in a more effective position in that the ankle is dorsiflexed. Dorsiflexion of the ankle pre-stretches the calf muscle and the Achilles tendon. The lower the block angle ( down to 30 degrees ), the greater the Achilles and calf muscle stretch and the greater the force the ankle joint can generate. Tellez & Doolittle suggest that angles in both ankles should be close to at least 90 degrees, helping the athlete to feel pressure in the rear block to a greater degree. 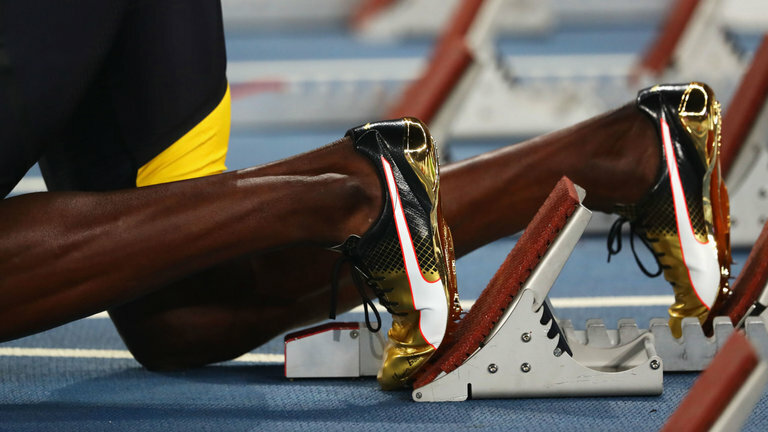 In order to get more pre-tension in the calf muscles, the first spikes of both feet should be positioned on the track. With pre-stretched calf muscles, it is possible to get a more efficient start. If the body mass is centred more on the legs than on the arms, pre-tension may be increased. Tellez & Doolittle (1984) recommend a similar foot position in the front block with the toes on the track surface, while in rear block, they suggest the tip of the toes of the shoe touching the track. This variation of rear toe position may emphasise the speed of departure of the rear foot from the block. In deciding the distance between the front foot and the starting line, ( Barbaro 1983)mentions that weight distribution, hip position and the effect of foot drive must be considered. If the front foot is too close to the starting line, much of the body weight will rest on it and the knee angle will be less than 90 degrees. arms, pre-tension of the calf can be increased. ( Mero ). In a study by Schot & Knutzen (1992) four sprint start positions were analysed with particular attention to ground reaction forces, horizontal forces and velocity. It was found that those with a greater distance between the front foot and starting line resulted in a greater propelling impulse, first step toe off velocity and a greater average velocity through a 2 metre speed trap. An important factor in determining the power and momentum developed in the sprint start is the angle of the front leg in the set position. Most literature accepts that an angle close to 90 degrees is the ideal angle in this position. It allows the knee extensors to work best at the correct time for maximum power and momentum to be developed. An angle in excess of 90 degrees may allow a faster leg speed out of the blocks but will not develop the same power and momentum. Borzov (1980) in his investigations into an optimal starting position, varies a little, with a suggested ideal front leg angle of 100 degrees. Opinions on rear leg angle vary between 110 degrees and 135 degrees. Tellez & Doolittle (1984) suggest an optimal angle of about 135 degrees for the rear leg because it allows the lever to move more quickly and allows greater impulse from a static position. They also suggest that an early body velocity provided by the rear leg drive past the front leg is a better mechanical position to accelerate through a more prolonged application of force. angles are too open affecting the optimal force against the blocks. Barbaro suggests the hips should be 6-12cm higher than shoulders. The degree of forward lean should be such that it is not too far to put pronounced pressure on the hands or too little that it inhibits forward displacement of the centre of gravity. If the hips are too far forward it will diminish front fast drive. If they are just above or behind the front foot their will be more vertical component instead of horizontal component in the drive out. The hips should be therefore just in front of the foot in the set position. The arm should be shoulder width or slightly wider. If they are too narrow the set position becomes unstable. If they are too wide, the head and shoulders drop too far below hip height. Reaction time has been described as the time elapsed between the firing of the starters gun, and the first reaction of the athlete. When automatic blocks are used in major championships it is deemed an athlete cannot react faster than 0.1 of a second. (Mero, Komi & Gregor 1992) defines reaction time as the time between the sound of the starter’s gun and the moment the athlete is able to exert a certain pressure against the starting blocks. Reaction time measurement currently includes the time it takes for the sound of the gun to reach the athlete, the time it takes for an athlete to react to the sound and the mechanical delay of measurements inherent in the starting blocks. 1. Premotor time: the time from the gun until the onset of EMG activity in skeletal muscle. 2. Motor time: delay between the onset of electrical activity and force production by the muscle. (Payne & Blader 1971) described an average Reaction time of about 0.09 seconds from the sound of the gun and the first rise by the force trace – this time was considerably faster than reaction times of the same athletes obtained by conventional methods. Possibly indicating a measurement of ‘ Pre-motor ‘ period of total reaction time. This theory was supported by the fact that this first rise in the trace did not coincide with perceptible movement of athlete. i. In all sprint events, reaction times of best athletes is less than 200m/sec. ii. In the same events, reaction times of females is greater than those of males. iii. Reaction times grow in proportion to the length of the race. iv. Reaction time plays only a very small part in the overall race performance. As the athlete drives from the blocks, the rear leg is pulled through fast; the front leg fully extends; the arms drive vigorously in a short arm action; while the head remains in a natural line with the trunk. greater than 45 degrees would lend itself to too much vertical component and thus sacrificing some early acceleration. An angle of less than 40 degrees may cause a stumbling effect necessitating short strides to correct the imbalance. However, Payne & Blader (1971) suggest that provided the athlete does not trip or interfere too much with subsequent running, it would seem that on the whole, as much horizontal impulse as possible should be striven for during the start. It was found that when athletes complained of stumbling out of the blocks, they had the best starts as measured by the mean horizontal acceleration and mean velocity over 20 feet. Payne & Blader (1971) also found that in general both rear and front feet started to exert forces on the blocks at the same instant. Athletes with the best starts usually had strong rear leg action. However, it was the front foot with its much longer contact time which provided the greater part of the acceleration of the body. into the first stride, keeping the shoulders low for the first few strides, and driving hard, without overstriding for the first few strides. recorded, the athletes were split into fast and slow groups depending on the time taken to pass the 2.5 metre mark. Harland found that higher speeds the faster starters could produce was due to the fact that the faster starters applied more force in a horizontal direction than the slower ones while pushing off the blocks. Time taken for the fast group to produce this force was less, and the average acceleration attained for this group when leaving the blocks was higher. Harland also found once the athletes had left the blocks, the faster athletes were able to position their centre of gravity significantly further ahead of the toe of their support foot at the moment of contact of the first step than the slower athletes, thus greater horizontal forces could be applied. As can be seen there are a whole range of variables that effect the sprint start. As a coach it is wise to consider the studies described and apply any information gained to the benefit of your own athletes. levels that assisted in his particular start being so successful. Johnson used a relatively high block angle and a short interblock distance (about 28cm), which would be classified as a Bunch start. With this type of start problems can arise in the push off because of the small angle of flexion in the knee joints. Johnson solved this problem by increasing the distance between his hands on the track and lifting his hips on set to give an optimal knee-joint angle. This type of start technique would be unsuitable for most elite athletes and not an advised technique for developing athletes who would have much lower strength levels than Johnson. With my own athletes I have a preference for low block angles and a medium interblock distance. This type of position appears to be supported by much of the research described. When I have had occasion to modify an athletes starting position from a higher block angle and closer interblock distance, I have found that once the athlete becomes used to the new position, although their block clearance is no faster, their twenty metres times have improved. However it must be remembered that there is no one block position or starting technique that suits every athlete, and a coach must take into consideration the individual characteristics of the athlete. As can be seen , there are a whole range of variables that affect the sprint start. Each of these variables can play a signifigant role in the overall performance of the sprint start.It can also be seen that some of these variables are directly related with others. As a coach , it is wise to consider the studies described in this paper and apply any information gained to the benefit of your athletes. Starting Sprinting & Hurdling Races 1992. 2. Barbaro V. – Comparison of Sprint Starts. 3. Baumann W. – Kinetic and Dynamic Characteristics of the Sprint Start. Biomechanics volume B (p195-199), 1976. 4. Borzov V. – Optimal Starting Position. Modern Athlete & Coach. January 1980. 5. Faithful P. – The Sprint Start. Starts at Different Front Block Obliquities. Medicine & Science in Sports & Exercise. (p1257-1263), 1992. 7. Harland M. – Report to Coaches & Athletes of Study on Block Start. 28/2/95. 8. Hay J. G. – The Biomechanics Of Sports Techniques. 4th Edition. (p 402-405) 1994. 9. 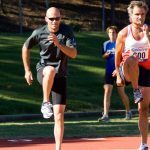 Jones T. – Coaching the Sprinter. Track Techniques No. 85. Summer 1983. 10. Korchemny R. – A New Concept for Sport Start & Acceleration Training. N.S. by IAAF December 1992. 11. Leuchenko A. 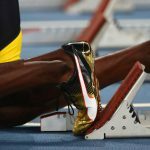 – 100 metres in 9.83 : The Birth of a Record. Legkaya Atletika 5 : 16-17. (1988). 12. Menely R. and Rosemier R. – Effectiveness of Four Track Starting Positions On Acceleration. The Research Quarterly . Vol 39 No.1. 1968. 13. Mero P.V., Komi & Gregor R.J. – Biomechanics of Sprint Running. Sports Medicine. 13 (6) 376-392. 1992. 14. Payne A.H. & Blader F.B. – The Mechanics of the Sprint Start. Medicine & Sport Vol 6. Biomechanics II. pp 225-231. 1971. 15. Richburg O. – Sprint Starts. Track & Field Quarterly 1990. 16. Schot P.K. & Knutzen K. – A Biomechanical Analysis of Four Sprint Start Positions. Research Quarterly for Exercise and Sport. Vol 63. No. 2. 137-147, 1992. 17. Sigerseth P. & Grinaker V. – Effect of Foot Spacing on Velocity in Sprints. The Research Quarterly Vol 33. No.4. 1962. 18. Stock Malcolm – Influence of Various Track Starting Positions on Speed. The Research Quarterly Vol 33. No. 4. 1962. 19.Tellez T. & Doolittle D. – Sprinting- Start to Finish.